At a tourist farm operated by a farming corporation called “Sera Highlands Farm” in Sera-cho, Hiroshima prefecture, a new variety of dahlia debuted at its “Autumn Dahlia Festival in 2016,” which is to be open at the farm until October 23. The dahlia was named “Koi-bana” (literally, “Carp’s Lovely Flower”) after the Hiroshima Toyo Carp, one of the professional baseball teams of the Central League in Japan, winning the league championship on September 10 for the first time in 25 years. 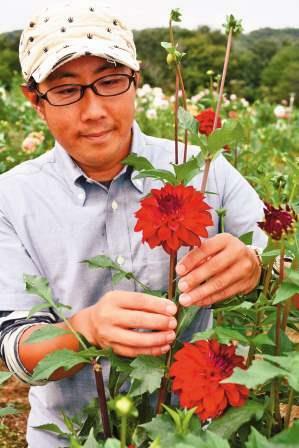 Sera Highlands Farm purchased a naming right of the dahlia from a plant breeder in Akita prefecture. At its Autumn Festival, one of the largest dahlia festivals in western Japan, more than 25 thousand plants of some 450 varieties are now enchanting lots of visitors. “Koi-bana” produces middle-sized flowers with a diameter up to some ten centimeters. The flowers are colored crimson similar to the team color of Hiroshima Carp. Seiya Yoshimune, 39, representing the Sera Highlands Farm, had gotten the naming right of the flower in expectation for a long-awaited Carp’s championship. “When I saw the flower of Koi-bana, I felt something dignified in its beautiful corolla. Its imposing appearance was really suiting to the image of our Hiroshima Carp,” he said. Staff members of the Farm joined a naming contest of the dahlia. The name of “Koi-bana” was nominated to express fans’ joy of celebrating the Hiroshima Carp on its brilliant feat of winning the championship of the Central League. This entry was posted in Food & Agriculture. Bookmark the permalink.